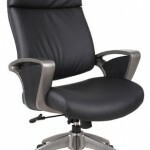 Beautifully upholstered in Black Leather Plus * Executive High back …. Dacron filled top cushions for added comfort. 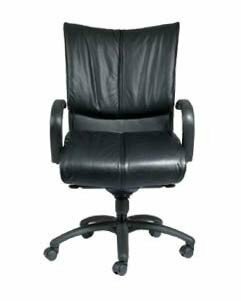 Pneumatic gas lift provides instant seat height adjustment.Adjustable tilt tension assures the right reclining tension.Upright locking control.Durable polypropylene armrests. Large 27″ nylon base for greater stability. Hooded double wheel casters. Arm height: 27″ -31″ H * Seat Size: 21″W x 20″D * Seat Height adj: 20.5 – 24″ H. Overall size: 27″W x 27″D x 44″- 47.7″H. Weight Capacity: 250lbs. 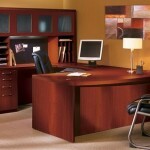 * Leather Plus is leather and polyurethane, for added softness and durability. Optional Knee Tilt mechanism upgrade available. Ask your Sales Associate ! !